With its bloodlines reportedly dating back to the ancient Aztec period, the world's smallest dog breed is also the oldest one in the Americas. It was named after the Mexican State of Chihuahua where the first of the breed were found, and subsequently recognized as such in the mid-19th century. Today, the popularity of the doe-eyed Chihuahua has secured its place in the arms of Hollywood celebrities as well as in American pop culture, with a star performance in its own right in a famous 1990's Taco Bell ad campaign, and most recently in the full-length Disney comedy Beverly Hills Chihuahua. 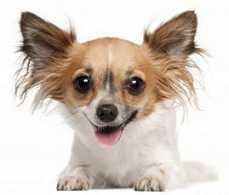 Despite the terms used by some breeders, only two types of chihuahuas exist - smooth haired and long haired. So-called "Teacup Chihuahuas" simply describes the smallest dog in any Chihuahua litter. Often viewed as nervous, high-strung and fearful of strangers, there is no other breed who is more devoted than the diminutive Chihuahua, who often wins your affection by licking your face and following you about as a constant companion. Chihuahuas are famous for exhibiting a ferocity that belies their size, and may even go on the offensive and even bite much larger animals if threatened. Experts advise that early training should always include socialization, mainly to avoid visitors or guests being attacked as intruders! Because of its small size, they can be easily injured during rough play and are not generally considered to be ideal pets for toddlers or young children. Much like human babies, Chihuahuas puppies are the only dog breed born with a soft spot in their skulls (known as molera). So guarding against head injury is all-important for the first six months of their life until their skulls are fully formed. As Chihuahuas age, they should be fed lightly and provided with ample opportunities for exercise to reduce the risk of hypoglycemia (lowered blood sugar levels) and diabetes, two conditions which Chihuahuas are especially prone. Genetically, is has been shown that the breed is also predisposed to nervous conditions and epilepsy. Due to their fragile necks, a body harness is preferred over a collar and, for short-haired breeds in particular, a warm sweater should be provided in cooler weather. American Kennel Club - Chihuahua - Here's the complete profile of the breed, with information on appearance, ideal proportions and gait, plus more on Chihuahua history & origins, fun facts, photos. Chihuahua Information & Pictures - Discover a general fact sheet on temperament, tips on overall health & common diseases, with pages of visitor-submitted photos in the picture gallery. Chihuahua Rescue & Transport - Here's a central clearinghouse for Chihuahua adoptions nationwide with contact details, online form, information on the approval process, related resources.